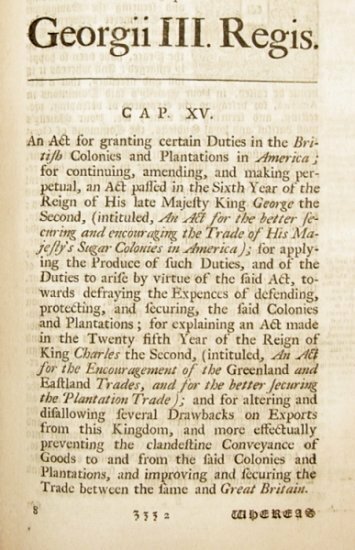 The Revenue Act of 1764, also known as the Sugar Act, was the first tax on the American colonies imposed by the British Parliament. Its purpose was to raise revenue through the colonial customs service and to give customs agents more power and latitude with respect to executing seizures and enforcing customs law. That the Act came from an external body rather than a colonial legislature alarmed a handful of colonial leaders in Boston who held that the Act violated their “British privileges”. 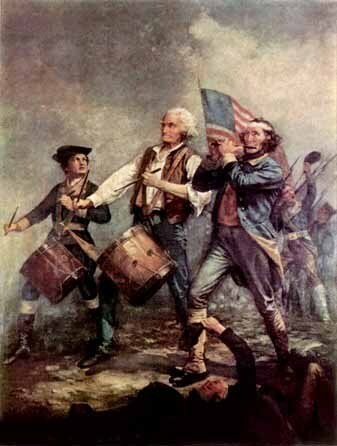 Their principle complaint was against taxation without representation. Just as important, however, were the Act’s profound implications for the colonial judicial system, for the Revenue Act of 1764 allowed British officers to try colonists who violated the new duties at a new Vice-Admiralty court in Halifax, Nova Scotia, thus depriving the colonists of their right to trial by a jury of their peers. The Sugar Act reduced the rate of tax on molasses from six pence to three pence per gallon, while Grenville took measures that the duty be strictly enforced. The act also listed more foreign goods to be taxed including sugar, certain wines, coffee, pimiento, cambric and printed calico, and further, regulated the export of lumber and iron. The enforced tax on molasses caused the almost immediate decline in the rum industry in the colonies. The combined effect of the new duties was to sharply reduce the trade with Madeira, the Azores, the Canary Islands, and the French West Indies (Guadelupe, Martinique and Santo Domingo (now Haiti)), all important destination ports for lumber, flour, cheese, and assorted farm products. The situation disrupted the colonial economy by reducing the markets to which the colonies could sell, and the amount of currency available to them for the purchase of British manufactured goods. The Sugar Act was passed by Parliament on April 5, 1764, and it arrived in the colonies at a time of economic depression. It was an indirect tax, although the colonists were well informed of its presence. A good part of the reason was that a significant portion of the colonial economy during the Seven Years War was involved with supplying food and supplies to the British Army. Colonials, however, especially those affected directly as merchants and shippers, assumed that the highly visible new tax program was the major culprit. As protests against the Sugar Act developed, it was the economic impact rather than the constitutional issue of taxation without representation, that was the main focus for the Americans. New England especially suffered economic losses from the Sugar Act. The stricter enforcement made smuggling more dangerous and risky, and the profit margin on rum, so the colonists argued, was too small to support any tax. Forced to increase their prices, many Americans, it was feared, would be priced out of the market. The British West Indies, on the other hand, now had undivided access to colonial exports and with supply well exceeding demand the islands prospered with their reduced expenses while all New Englanders saw the revenue from their exports decrease. The foreign West Indies had also been the primary colonial source for specie, and as the reserves of specie were depleted the soundness of colonial currency was threatened.